I’ve slowly been becoming more and more apathetic towards professional cycling over the last few years. I had grown sick of the constant failed drug tests and the “you doped”/”no I didn’t”/”I know you were molested as a child”/”you disagree with Lance so we will destroy you” attacks between the cyclists, coaches and sponsors. Because of all of the bad news always overshadowing the good, I was starting to not enjoy the actual sport any longer. 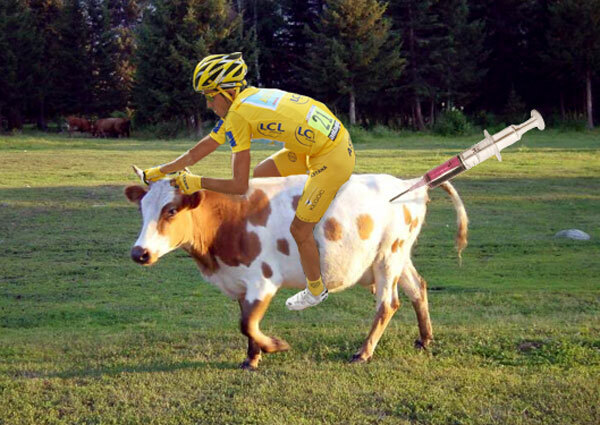 But for some reason the recent Alberto “El Pistolero del Toro” Contador saga has drawn me back in to the fold. I don’t really know why. I think it started for me at the very beginning with “The Steak”. Most everyone that follows cycling knows that Spanish riders (pro and amateur) are among the biggest violators of the doping regulations. I mean come on, one of the biggest (if not the biggest) doping scandals in cycling history occurred in Spain. So when the news came out that Contador failed a drug test during the Tour de France the world of cycling noticed but by no means was it shocked or even surprised. But then the excuses started. I didn’t think anything would ever beat the Landis ‘shot of whiskey’ defense, but a steak? A wholesome, juicy and delicious hunk of bovine? 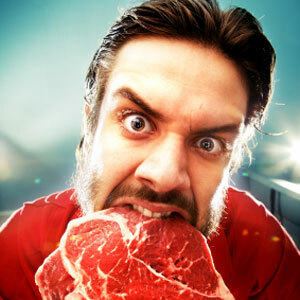 Now how could you blame a steak? That’s like being angry at your best friend, your dog and Bill Murray all at the same time. From that point, I knew that this was going to be legendary. In case you’re not up to date, here are some articles, tweets and comments that I have found to be informative and humorous. Tweet from VeloRacer5: Contador cleared of doping charges. Landis to apply for Spanish citizenship. Tweet from FakeUCI: We plan to announce randomized beef testing just as soon as we figure out how to get a bull to pee in a cup. An overview of the current situation and how Spain refuses to punish their most popular athlete and favorite son. A good opinion about the silly-ness of the steak defense. And last, but not least, how the Spanish meat producers (Asoprovac) are reacting to be thrown under the bus by Contador, the Spanish Prime Minister and the Spanish cycling federation (RFEC). Note: Use of clenbuterol was banned in Europe in 1996, so blaming a steak is also accusing the meat producers of engaging in illegal practices. Where is this all heading? Who knows, but I’m sure that it will drag on for months or maybe even years. Either way it’s a lot more exciting than the Tour of Oman or the Volta ao Algarve, so for now I will just sit back and enjoy saga as it unfolds. I had a great time at the 2011 Dickie Scramble and I’m positive everyone else there had a great time as well. Drew and Laura hosted a spectacular event and I will do everything in my power to encourage them to continue organizing the ride every year. Maybe I’ll just mark February 11, 2012 as the date for the next edition of the Dickie Scramble. I also want to send my heart felt thanks the support crew for the ride. Their energy was yet another reason this ride was so grand. I still do what the kid in this commercial does and I’m an adult. Well, kind of an adult.